ANSI Z87 VenusX Safety Reading Glasses Bifocals Grey +1.0. Approximately 3/4" tall magnifying diopter power in lower portion of lens. 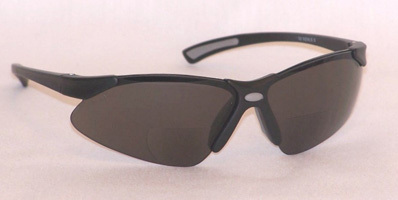 Black frame, sunglass grey bifocal reading lenses. Shatter resistant, polycarbonate lenses that shield 99.9% of UVA and UVB light. Zero distortion lenses. Precision engineered to provide superior visual clarity. Soft nosepiece and soft PVC inserts on temple tips for extended wearing comfort. Light and comfortable fit. Sporty and stylish. 5.25" width from temple hinge to temple hinge. Hard coated, scratch resistant lenses. Meets ANSI Z87+ safety standards.